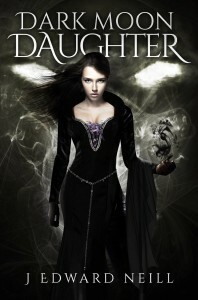 Release Day – Dark Moon Daughter – New cover art! New ebook cover art now available! A little background on the new cover: Andelusia Anderae, part-time heroine in the epic-length Down the Dark Path, takes center stage in Dark Moon Daughter. That’s the Black Fire roiling in her left hand. And yes, that’s the first official image of an Ur in the background. Note the white eyes (like stars). If you look closely, you’ll see its mouth opening up behind Andelusia as if to devour her. Andelusia’s magic is meant only for suffering and death. One flicker of black fire, and the world will burn. One word uttered, and the Ur will butcher every living thing. In her heart, she knows what she must do. Fight them… …or join them. New cover art for the softcover version will be out any day now. Look for updates here at Tessera AND at my Down the Dark Path web abyss.